Hey Video Guy – Hurry UP!!! Here is Michael Fletcher at work with his trusty Canon 5DMkII. Doing what he does best. Video! Quite often during our trip we’d drop Michael off on an island and then shoot through across to another location. On our way back to the island to pick him up you’d always hear Christian yell out “Hurry Up” hehe. Mike’s work is absolutely amazing if you’ve not seen it before you can check it out over here. 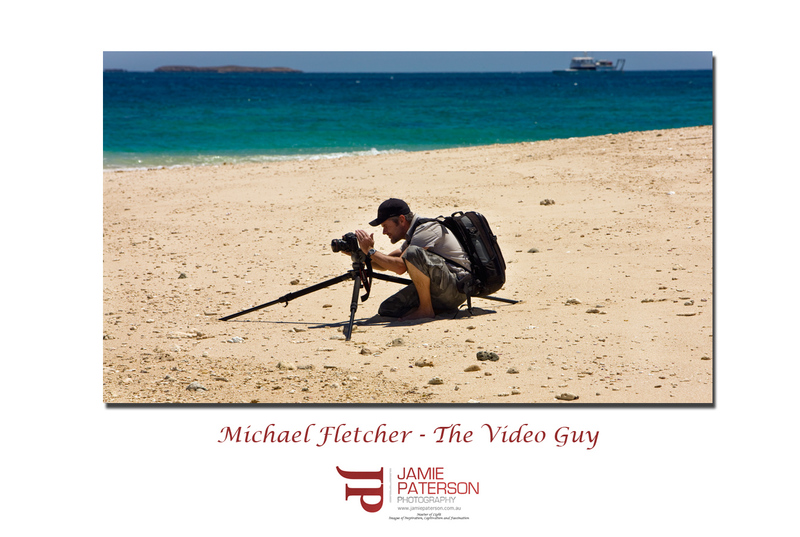 This entry was posted in Australian Landscapes, Australian Seascapes and tagged Jamie Paterson, michael fletcher, monte bellos, video. hey Jamie probably your best photo ever:) The reason why I had to get of the boat was that it was bouncing around too much. It’s ok for you stills boys shooting 1 frame at 1/1000 of a second. Thanks for the wrap and link mate. Are you going too the big pizza showdown at Marks? Yes I’m definitely going to the Pizza night. Wouldn’t miss it for the world!